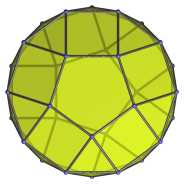 The gyroelongated pentagonal bicupola is the 46th Johnson solid (J46). It has 30 vertices, 70 edges, and 42 faces (30 equilateral triangles, 10 squares, and 2 pentagons). The gyroelongated pentagonal bicupola can be constructed by attaching two pentagonal bicupolae to a decagonal antiprism, or equivalently, adding a second pentagonal cupola to a gyroelongated pentagonal cupola (J24).